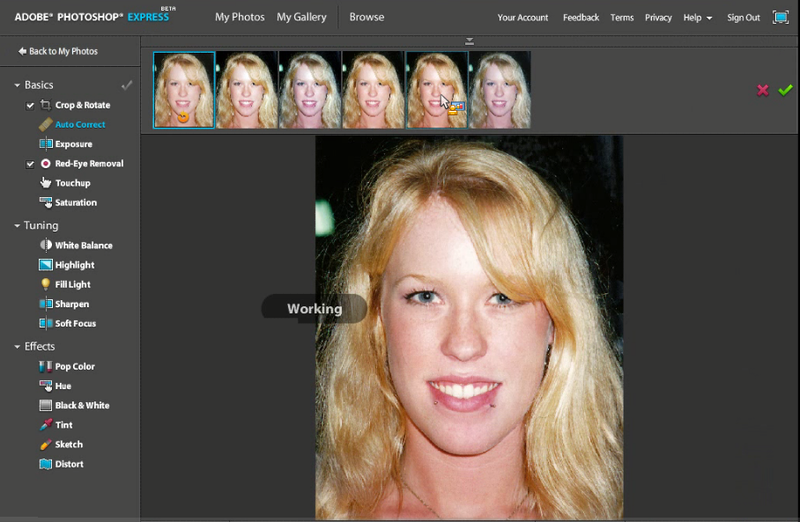 Adobe Unveils Webtop Version of Photoshop. Picnik Is Not Scared. 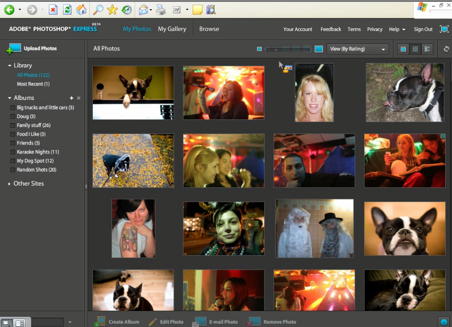 As I alluded to in an earlier post, online photo-editing applications keep getting better as the competition heats up between startups like Picnik and FotoFlexer. Today, a very large competitor, Adobe, is entering the market by releasing a Web-based version of Photoshop for editing pictures called Photoshop Express. It is in public beta and anyone can sign up. Photoshop Express is by no means just Photoshop ported onto the web. It would even be a stretch to say it’s a stripped down version of the desktop software, since it’s intended for mainstream consumers, not professionals. This distinction shows in both what it lacks and what it offers. There are only 17 editing features in Photoshop Express: a tiny fraction of those available with the $650 desktop software. And all of these 17 features are filters intended for tuning and effects – you won’t find any tools for drawing lines, adding text, or creating shapes. What you can do is easily take out red eye, touch up undesirable areas, change saturation, pop color, and crop (among other things). One of the most innovative features in Photoshop Express is the ability to revert any filter you apply to a photograph. You can do this to a particular filter regardless of whether you’ve made other changes to the photo since applying it. All you have to do is uncheck the particular filter and it will be subtracted from your changes, which are represented in a historical filmstrip with all versions of the photo you have gone through. This undo functionality for particular changes partly makes up for the unfortunate absence of layers, which are so vitally important in the desktop version of Photoshop. Photoshop Express also differs from its desktop cousin by serving as an online storage and photo sharing service. You can upload up to 2GB of photos to the web app (or pull them in directly from Facebook, Photobucket, or Picassa). They are arranged in a collection that can be made available to others or kept private. 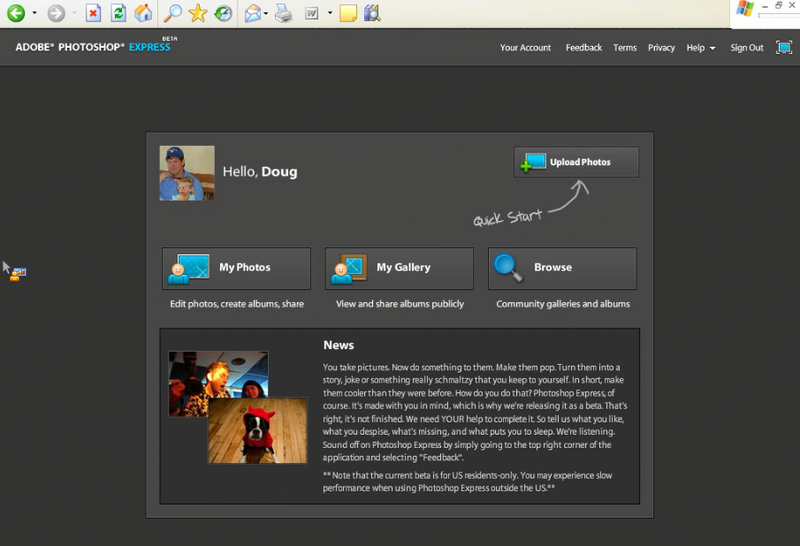 Embedding and slideshow functionality is also available. It is a showcase of what is the best that can be done with Flex and Flash. Hopefully, it will inspire other developers. We are also setting up a hosted services platform that we can expand to other products. We don’t envy the challenge Adobe is facing—they have to deal with not cannibalizing a highly successful finished-goods business. Adobe has a business to protect, while Picnik has a business to build. Sure, I think their distribution is a great strength for them. And there’s definitely a Windows vs. Mac analogy here. But i think today’s internet is so incredibly efficient that traditional models of distribution may matter less and less. The cost of switching apps for most users is just so easy. They can find new things really fast and try them out. Hopefully, I am not smoking crack but I do think the marketplace is so efficient that we can compete based ultimately on quality and ‘winsomeness’ of the product (to use a very old fashion word). No Jonathan, you’re not smoking crack. May the most winsome product win.